Hybrid smartwatches led by traditional watch makers is about to witness a breakout year and register stellar growth thus contributing to positive growth for the stagnant smartwatch segment. The smartwatch segment hasn’t been able to live-up to the early hype created around it, failing to achieve the expected sales growth in 2016. However, the smartwatch market is about to witness momentum this year in majority aided by “hybrid smartwatches” category. 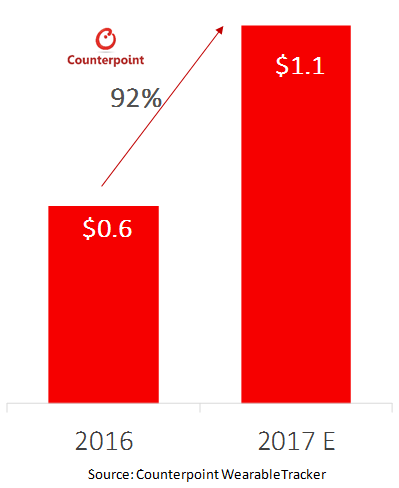 As per Counterpoint’s latest research, the hybrid smartwatch segment will cross US$ one billion mark in revenue in 2017, almost doubling annually. The Hybrid smartwatches look and function like traditional analogue watches to the naked eye, but include smart features like step tracking, heart rate monitor, notifications and even NFC enabled payments. They connect to smartphones through dedicated apps available on iOS and Android stores allowing users to use the watch with traditional look and feel with smart functionalities. Commenting on the potential of hybrid smartwatches, Counterpoint’s analyst Mudit Singh notes, “With sales of traditional analog watches under pressure from the likes of Apple and Samsung, luxury traditional watch brands such as Fossil Group, Tag Heuer, Citizen group and others, are turning to hybrid smartwatch form-factors to get a share of the smartwatch pie leveraging their core competency “design and craftsmanship”. Wearable tech brands including Garmin, Misfit, Withings (now, Nokia) among others are also now adopting the hybrid approach to enable greater battery life and drive usage as well as user experience”. Mr Singh, further notes, “The rise of hybrid smartwatches can be attributed to traditional watchmakers trying to address two key pain points which has held the smartwatch segment growth – Firstly, preserving the traditional, aesthetics style, look and feel, secondly, maximizing the battery life while retaining ‘meaningful and frequently used’ smartwatch features”. Exhibit 2: Share of Hybrid Smartwatches of the Total Smartwatch Segment. 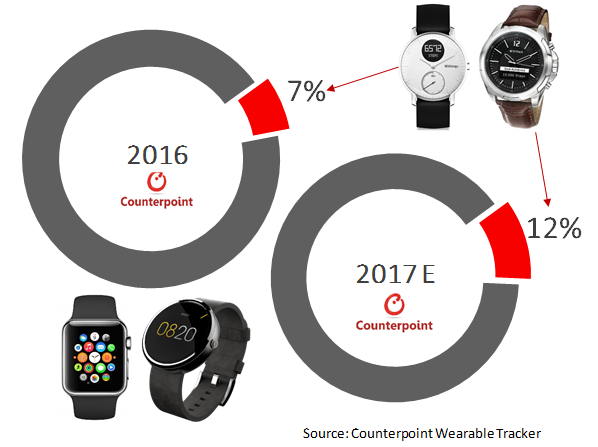 Hybrid watches will grow exponentially in 2017 and will penetrate almost 12% of the smartwatch market. More traditional watchmakers along with tech wearable makers will shift towards hybrid watch. The wholesale revenue of the hybrid watch market in 2017 will double from the previous year, crossing a Billion$ mark. AI enabled hybrid watches will also be on rise, with the trend having already been adopted by brands like Martian and Guess. The hybrid watches have strong potential to compete with smartwatch as it addresses key pain points while not compromising on aesthetics. We estimate them to capture almost one quarter of the smartwatch market by mid-2018. 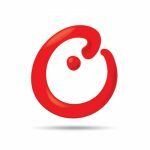 Please feel free to contact us at press@counterpointresearch.com for further questions regarding our in-depth latest research, insights or press enquiries.